Home » right » Laying on Right Side Worsens Acid Reflux! Laying on Right Side Worsens Acid Reflux! Well that's according to a recent New York Times article on October 25, 2010. This claim is based on several studies published whereby “the total amount of reflux time was significantly greater” when the subjects laid on their right side after eating a high-fat meal. This makes sense anatomically. 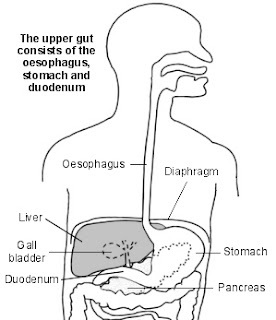 Keep in mind that the stomach is located on the left side and the esophagus (swallowing tube) is located in the middle (comes off the stomach's "right side" so to speak). When you lay down on the right side, gravity is literally "emptying" the stomach into the esophagus located in the middle. Laying on the left side has gravity keeping stomach contents inside the stomach as the middle is now above the stomach. Of course, the best thing to do is lifestyle changes to minimize reflux including- avoid eating high-fat, spicy, acidic foods as well as not eating/drinking within 3 hours of laying down when the stomach is empty. Keeping the head and chest elevated 30 degrees is also helpful thereby using gravity to help keep things down. Mattress wedges are helpful. Should lifestyle changes not help, there are plenty of medications that can help. Read more about reflux here. Body position affects recumbent postprandial reflux. J Clin Gastroenterol. 1994 Jun;18(4):280-3. Effect of different recumbent positions on postprandial gastroesophageal reflux in normal subjects. Am J Gastroenterol. 2000 Oct;95(10):2731-6. It's not "laying" it's LYING on the right side. Sorry pal,..."lying" is what politicians do, "laying" is what happens in bed !